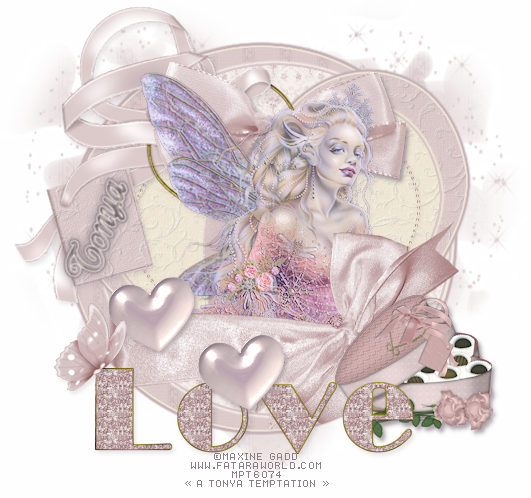 • A Softer Look at Love scrapkit made by the very talented QueenBrat it is available for purchase at her store. • I used a tube I had purchased of Maxine Gadd's which I purchased at My PSP Tubes. Please do not use this artist's work without a proper license to do so. • Template I used was by Missy of Divine Intentionz, I used template 40. • Filters I used were Xero Porcelain, Eye Candy Gradient Glow, Super Blade Pro (coconut ice setting), and Eye Candy 5 Perspective Shadow. • Font used was Constanza which I cannot share, but any scripty font will work nicely. Larger Circle: select all, float, defloat, add a new layer and paste paper of choice into selection on new layer. Select none and delete the original layer. I used paper 2 and because the tube I used was a bit on the purple/mauve side, I used my manual color correction tool and change the tone of the paper to match the tube. Small Circle: I did everything the same as with larger circle except I used paper 7 and again used my manual color correction tool to change the tone to match my tube. Larger Heart: Select all, float, defloat, add new layer and paste paper of choice into selection on new layer. I used paper 13 on this one. Select none and delete original larger heart layer. Smaller Heart: Repeat same steps as with Larger Heart, I used paper 15. Dotted Line Heart: Add a new layer and flood fill that layer with a color of choice, I used a purple color from one of the papers. On the Dotted Line Heart layer, select all, float, defloat, invert selections and on the flood filled purple layer select delete. Delete original Dotted Line Heart layer. Apply an inner bevel of choice to the new layer, I also applied Eye Candy 5 Perspective Shadow. Small Hearts: Add a new blank layer and flood fill with purple color again. On original layer, select all, float, defloat and invert selection, press delete and select none. Delete the original Small Hearts layer. On the layer you just created, select all, float, defloat, apply Super Blade Pro (coconut ice setting). I used the 3rd shape from the top but use whatever shape setting you like best in the filter. • Okay then it's starting to look really purdy right? Now let's put our tube in there. Under the small hearts layer, paste tube of choice as a new layer, and re-size as needed. On the smaller heart (the one that has a cream color tone in my tag), select all, float, defloat, invert selections. On the tube layer, erase any parts that hang over the edge you don't want showing. • I applied a slight gradient glow to each of the circle and hearts layers, use whatever colors and preferences you think looks good. On the white background layer, select all, add a new layer and paste paper of choice into selection on new layer. Apply mask of choice, I used the one called "heartmask" in the pack of masks I linked you to above. Merge layer group. If you wish to, you can use your manual color correction tool to adjust the color to match your tag the best. I used my deform tool to make the mask fit best to the tag. • Add elements of choice from the fabulous kit. See my tag just as a guide, make the tag your own, there is a ton of beautiful elements in the kit for you to choose from. On a couple of the elements I did use my manual color correction tool to match up close to the rest of the tag. I applied drop shadows as necessary to the various layer. Do any cropping you need at this point and re-size if you wish. I sharpened and applied Xero Porcelain to the tube. Add the artist's copyright and your taggers watermark. • All that's left is the text! I used font Constanza and applied a nice inner bevel and gradient glow with a drop shadow, rotating it to fit into the tag of the Love Note element I used. If needed use your deform tool to adjust. This tutorial was written by Tonya on January 27, 2010 and absolutely no part of this tutorial may be taken or used without my express permission. Any similarities to any other tutorial is purely coincidental.